Ever had those nights when you just want to go out and enjoy a drink or two (or three) with your friends after work, but don’t really want the whole noisy, crowded street that comes along with a Friday night out? There’s a space to escape to, even in Poblacion. Enter Fyre Rooftop Lounge—a bar/lounge concept by Locavore’s chef Mikel Zaguirre. 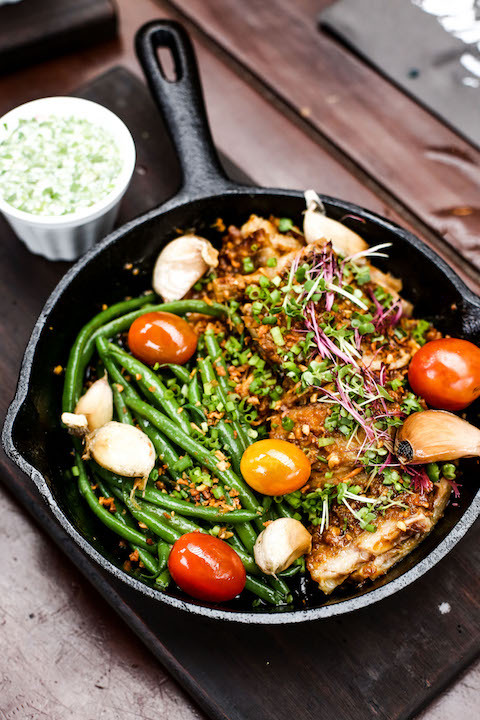 Located at the third floor of a building on the corner of Guerrero and P. Burgos streets, Fyre offers a nice vantage point from which you can enjoy a drink and a meal backed by Makati’s city skyline. Talk about chill, right? But if there’s anything not chill about the place, it’s their selection of drinks. Owning up to its name, Fyre’s cocktails are pretty much on fire. Literally and figuratively. One of their signature drinks is called Roof is on Fyre, a pink, gin-based drink that comes in a flaming glass. The spicy notes come from the falernum syrup which has flavors reminiscent of ginger, lime, vanilla, cloves, and allspice. The hibiscus syrup, on the other hand, gives the cocktail its pinkish hue. If you don’t want the taste of alcohol but still want a boozy kick, go for the Ninja Moves cocktail. It comes in a lemon-shaped glass that, when opened, reveals a little lemon peel “boat” that carries sprigs of burning rosemary, that add a smoky flavor to the drink. This cocktail has a Suntory base and is flavored with citrus like Japanese yuzu and lemon. Aside from straight up cocktails, Fyre also offers beer cocktails. For something light, try the Stellar Kiss, which uses Stella Artois mixed with rosemary, gin, and peach. For a stronger flavor, go for the Dark Horse, which uses Red Horse, mixed with coffee liquor, caramel, and orange juice. 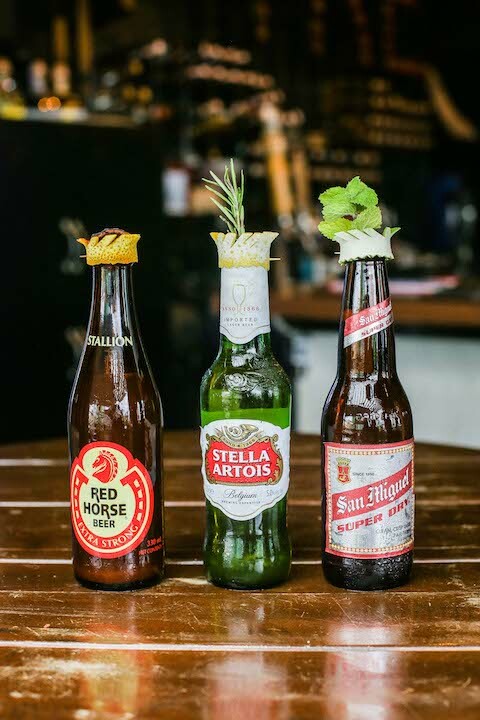 Whatever you choose to drink though, make sure to pair them with any of Fyre’s bar chow, which are pretty much jazzed up versions of nostalgic childhood favorites and favorite Filipino comfort food. Their spicy noodles, for example, hark back to the pancit canton of our youth. 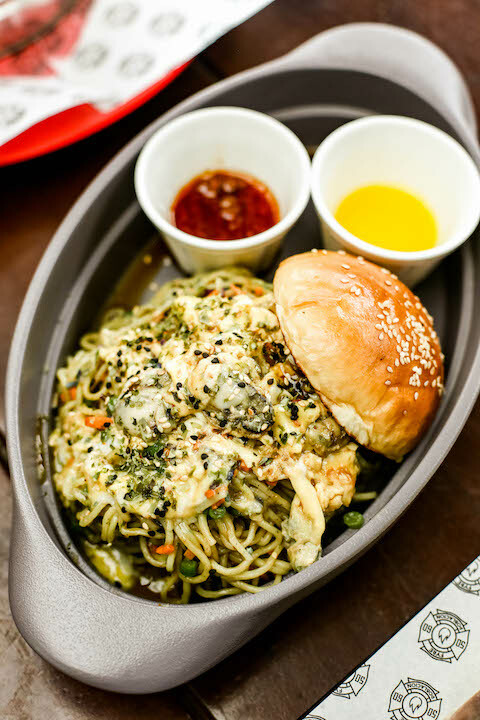 But instead of the plain ol’ pancit in pandesal combo, Fyre’s pancit comes topped with an oyster omelet, and served with a soft brioche bun. They also provide chili sauce and calamansi so you can flavor your noodles to your liking. For something more apt for pulutan, the Fyre sisig hits the spot, offering sisig with the additional sinful crunch of chicken skin. But if you’d like to fill up before heading for the bar, the red curry beef would be a good choice (and it might remind you of Locavore, too). 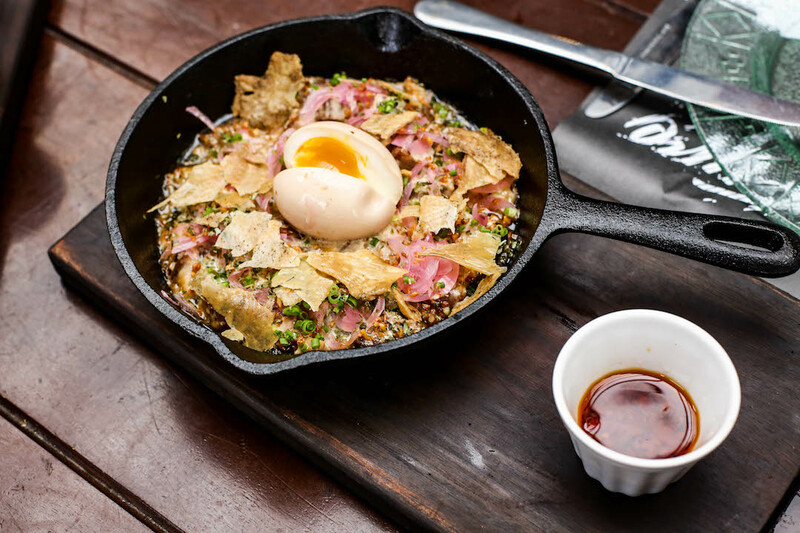 Pair their unique beer cocktails with new takes on old favorites, such as the spicy noodles—an "adult" take on the childhood pancit canton with the added oyster omelet and brioche bun. 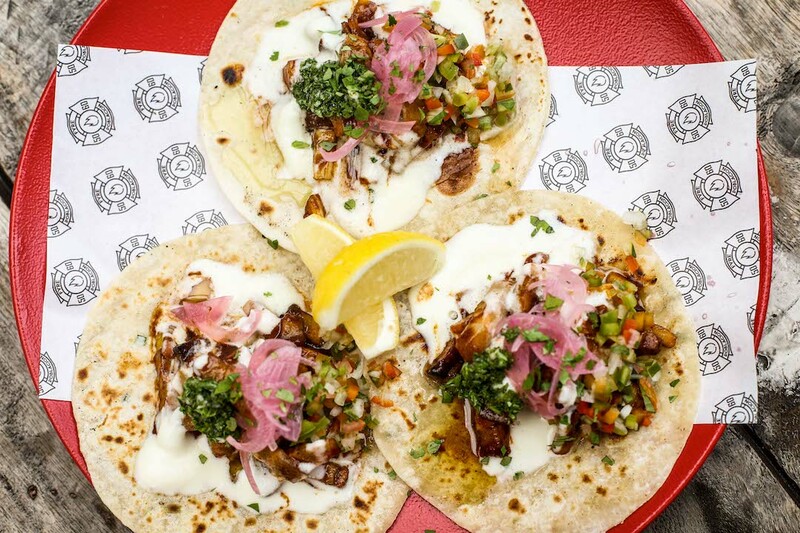 Or the Fyre sisig which comes with chicken skin for added crunch.